Authors, Music, Art: Next Saturday! It's a big deal, and it's coming to Book Exchange. Four winning authors, art, music and food. What are you waiting for? 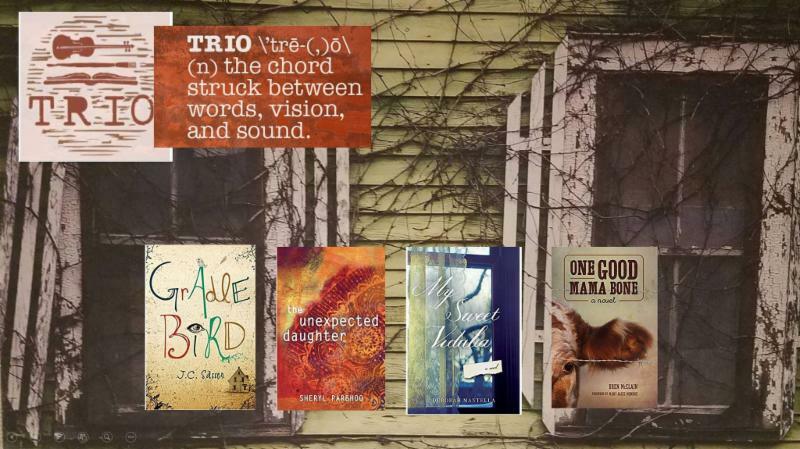 Help us pull out all the stops for one cool TRIO PARTY at Book Exchange . Each year, a novel is paired with a singer/songwriter who writes and produces a song inspired by the novel and a visual artist who creates a work of art inspired by the novel. Trio: Get it???? As a result, a traveling art exhibit of music, words, and visuals travels throughout the South to independent bookstores, like BOOK EXCHANGE! On Saturday, November 11 at 2:00, we will hear from FOUR (Trio + One?) fantastic authors: J.C. Sasser, GRADLE BIRD ; Sheryl Parbhoo, THE UNEXPECTED DAUGHTER ; Deborah Mantella, SWEET VIDALIA ; and Bren McClain, ONE GOOD MAMA BONE . There will be MUSIC , ART and of, course, FOOD to go along with these amazing authors. It’s truly an event you don’t want to miss! It’s a great way to support literature, the arts AND your favorite independent bookstore, BOOK EXCHANGE . Also, it’s FREE , so bring a Trio of friends along to: Book Exchange, 2932 Canton Rd., Ste. 220, Marietta, GA, 770/427-4848. 11/24, BLACK FRIDAY-- Stay tuned for details about gift cards and specials! In addition to signed books from our visiting authors, get ready for new inventory, both books and merchandise, so that you can start your holiday shopping at Book Exchange! As always, we appreciate your business. Come see us soon! Book Exchange, 2932 Canton Rd., Ste. 220, Marietta, GA, 770/427-4848.